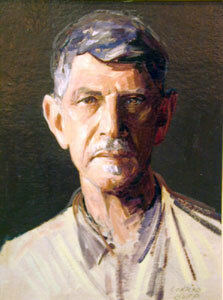 Conrad Buff, Self Portrait, Oil on Board, 17" x 13"
All his life, Conrad Buff (1886-1975) loved mountains. Once, as a small boy in Switzerland, he wished to please his father by bringing home a bouquet of rhododendron from the neighboring hills. Without a word to anyone he left the village where his family lived, not knowing how far away and steep the mountains really were. He gathered flowers as night began to fall and his feet began to ache. The boy realized a good lashing from his mother awaited him at home, but when his father heard about the arduous trek and saw his son’s tiny gift there was no spanking. Buff recalled that his father simply “melted.” The mountains and flowers, his father thus taught him, are very important things. In his early 20s, Buff brought his love of nature with him from Switzerland to California, where he became one of the state’s most stubbornly individualistic painters. He always maintained respect for careful craftsmanship and time-honored traditions, but at the same time he responded to modern art movements and experimented with new methods. 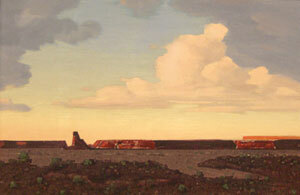 Along the way, he found vibrant ways to express the western landscape in shape, line, and color. 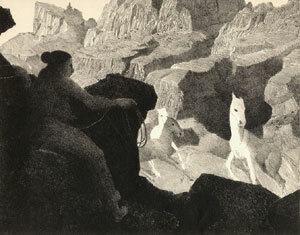 Conrad Buff, Catching Wild Horses, Etching, 8" x 10"
Conrad Buff II was born on January 15, 1886, in the Swiss village of Speicher. His interest in sketching began to develop in grade school, where an enlightened teacher encouraged the young boy in both art and music. His drawing skills led him toward his father’s early career in embroidery design. He entered the School for Arts and Crafts in nearby St. Gallen in 1900 at age 14. Life as an art student proved to be a struggle for Buff. When he ran out of money and saw no future for himself, the young artist wanted to leave Switzerland to get away from the narrow, conservative mentalities that he said oppressed him. He visited the family of a school friend who had left for America and discovered that his former classmate now lived on a cattle ranch in Wyoming. Then and there, Buff decided to seek his fortune in the faraway American West. In 1905, Buff arrived in America. He drifted through a succession of jobs – painting, shepherding, washing dishes, and baking – as he made his way west. Arriving in San Francisco in 1907 just a year after the famous earthquake, he found the city in ruins. Like many others before him, Buff headed south to Los Angeles with no money, friends, or plan. Conrad Buff, Maynard Dixon's Back Porch, Oil on Panel, 11" x 15"
Initially, Buff earned a living painting houses. Living frugally and practically, he was able to purchase a small piece of land in Eagle Rock and a horse to cart his supplies from one job site to another. His goal of becoming an artist was far from forgotten, though, and Buff managed to reserve some time to spend at home painting pictures. Sometime between 1910 and 1913, he attended the Art Students League of Los Angeles but was dissatisfied with the instruction there. He next attended evening drawing classes taught by William A. Paxton at Los Angeles High School. There Buff painted some portraits in addition to his first love, landscapes. His most striking work of this period, however, was a series never shown publicly: hundreds of small, nonobjective oils unlike anything painted in Southern California. Conrad Buff, Mittens / Trees in Landscape, Oil on Board, 13" x 20"
California Impressionism was the dominant style during Buff’s early years in the Golden State and thus influenced his work. It was not a formal school or movement but a regional variant of American Impressionism, which was derived from the innovations made in late 19th century France with outdoor light and color. Among the best-known painters working in Southern California were William Wendt, Guy Rose, and Granville Redmond, all of whom specialized in outdoor landscape painting characterized by high-keyed palettes and relatively loose (though not form-dissolving) brushwork. Their primary subject matter was the landscape as an emblem of plenty, grandeur, sensual richness, and the essential goodness of nature; it would become Buff’s primary subject matter, too. In a major landscape work of the 1920s, Untitled (Near Convict Lake), Buff used the broken brush stroke of impressionism but retained clear outlines and solid forms. In later years, in paintings such as Canyon, his desire to capture the fleeting color patterns of the desert intensified, but he always insisted on constructing his paintings carefully and painstakingly, like an architect designing a building. Indeed, among his early friends and influences were the prominent architects Rudolph Schindler and Richard Neutra. Virgin Country, Utah is typical of his flair for visual drama, with his cloudless blue sky behind the hard-edged shadows of red-orange cliffs rising out of the desert. The architectural quality of such images and their almost mathematical severity of composition combined with a brilliant, modern palette didn’t always satisfy a public accustomed to the pleasant softness of regional impressionism. Conrad Buff, Red Butte, Oil on Board, 23" x 35"
Throughout his ongoing exploration of “magnificent forms,” Buff used the cross-hatching technique he developed in the 1910s. His untitled view of the Southwest painted around 1950 is composed of minute strokes of reds, oranges, and violets that enliven crisp and defined shapes. In later years, particularly the 1960s and early ‘70s, Buff often worked with a thicker brush stroke that reduced detail. In Mesa, Buff’s cross-hatching is replaced by broad strokes that both stand alone and overlap. He worked to create images of clearly articulated, interlocking shapes that evoked the weight, solidity, and space of the landscape he was painting. He discovered that this type of image offered a sense of immediacy and power not unlike that of his more detailed, epic landscapes and murals of the 1920s and ‘30s. 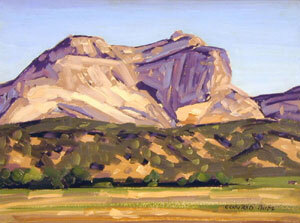 The final phase of Buff’s lifelong aesthetic pursuit is represented by a fantastic series of landscapes of southern Utah. 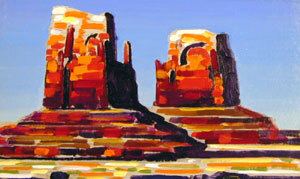 Monument, from about 1970, is a culmination of Buff’s fascination with the “magnificent blue” sky of wild Utah and its juxtaposition with its complementary color, orange, which pervades the red rocks. Orange is applied in thick stripes, with yellow ribbons above and red ones below. Above the yellow striations is a band of pure white, and below the red is violet. Buff relies on the primary colors red, yellow, and blue and simple admixtures along with black for the shadows to realize this simple yet visually arresting image. In Monument, there are no details to distract from the fundamental configuration. What remains is a series of shapes and colors placed next to each other – Buff’s definition of the art of painting. What is expressed through those shapes and colors is an intense, focused, and genuine experience of nature.